“I promise to loyally fulfil the duties of the post of regional president being faithful to the will of the Catalan people represented by the Catalan parliament,” he said, using the same formula as his predecessor and mentor Carles Puigdemont. The 55-year-old did not promise to obey the statute that regulates Catalonia’s autonomy either. He appeared flanked only by a Catalan flag, without the traditional Spanish flag and portrait of the king that protocol states must be present, in a small side-room of the regional government building in Barcelona. The ceremony marks the end of close to seven months of political limbo in this region of northeastern Spain which has been under direct rule from Madrid since it deposed Puigdemont after a failed declaration of independence on October 27th. Torra, a hardline separatist, was handpicked by Puigdemont, who is currently in Berlin awaiting potential extradition to Spain where he faces jail on charges of rebellion and misuse of public funds. He has stressed he is merely a “caretaker president” as he awaits the return of Puigdemont, whom he considers the “legitimate” leader, and has pledged to keep fighting for independence from Spain. 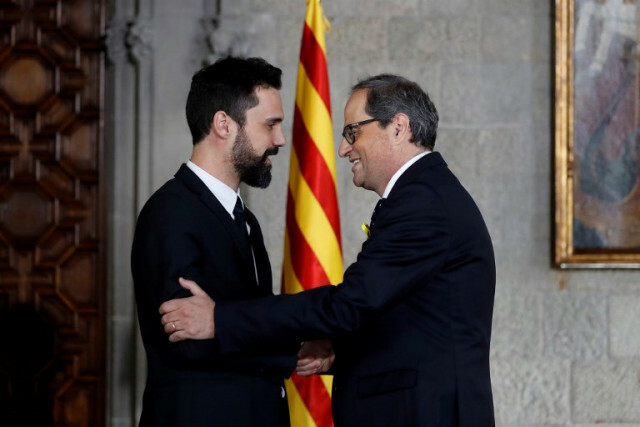 Torra’s swearing-in ceremony only lasted a few minutes and the central government decided not to send any representatives in a sign of tensions between the two. There were no representatives of political parties or civil society either, and only a few people close to Torra, regional parliamentary speaker Roger Torrent, a top regional government official and the head of Catalan police were present. As a deferential gesture towards Puigdemont, Torra did not put on the medallion that regional presidents usually wear when they are sworn in. But even before the ceremony, Torra drew controversy over a series of tweets and articles written over the past years deemed to show hate towards the Spanish.